The sixteenth century saw a transformation in the single-handed sword, both in its form and in its use. It was increasingly worn by civilians, as a fashion accessory and as a dueling weapon. The hilt gradually developed sweeping bars and loops to protect the unarmored hand, and especially the forefinger, as the current practice was to hook it over the crossguard to increase control of the point. Blades became longer and more slender for long-distance thrusts (and the manipulation necessary for fast, accurate targeting). There is much disagreement as to how to define a “rapier”. The word itself (which has several possible origins) was not used by its contemporaries in the Romance countries, who simply called the fashionable weapon of their day a “sword” (spada, espada, epee). Only the English and the Germans used the term, and they seemed to be referring to very specific (and very different) forms of the weapon. The English word “rapier”, and the French “rapière”, gradually came into common usage by the nineteenth century to refer to any type of old thrusting sword, but especially one without much of a cutting edge. The problem is compounded by modern collectors and museum curators, who label as “rapier” any single-handed sword possessing a complex hilt, regardless of the shape of the blade or its intended use. 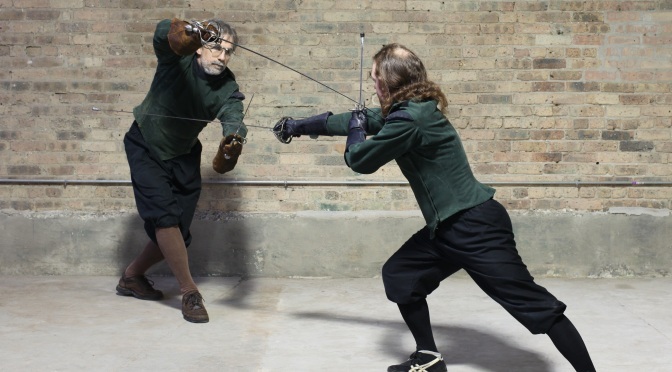 Modern practitioners, for the most part, commonly understand the word “rapier” to refer to a relatively long and slender-bladed, complex-hilted sword, optimized for thrusting, that was the duelist’s weapon of choice throughout western Europe from roughly the late sixteenth century through most of the seventeenth. The fencing systems associated with it, developed in Italy and Spain in the last half of the 16th century and then spreading northward, confirm its primary use as a thrusting weapon, capable however of disabling, slashing cuts. At the height of the rapier’s fashion in the early seventeenth century, a typical specimen would weigh between 2 and 3.5 lbs (908-1589 g) and measure 4 ft. from point to pommel tip, with a blade width of 1 inch at the forte, and a blade length of 40″-43″ (101-109 cm), balancing about 4″ down from the crossguard. Blades as long as 48″ were not uncommon in some parts of Europe; the illustrations in the principal fencing treatises of this period show extremely long blades. By the last quarter of the sixteenth century, the rapier’s hilt was fully developed to protect the hand, and subsequent changes were largely a matter of personal esthetics and fashion trends; though the addition of solid plate in the front of the guard, to protect against a thrust, was obviously a practical response to the use of the point. Despite its obvious advantages, the Spanish “cup-hilt”, which appeared later on in the period, oddly never became popular in northern Europe (except in countries under Spanish rule).